Last night marked the first official home game of the Milwaukee Bucks 2011-2012 season and the Bucks celebrated the occasion by defeating the Minnesota Timberwolves, 98-95. Bucks rookie and former Wisconsin Badgers standout Jon Leuer was instrumental in helping the Bucks stay on top of the Timberwolves at the Bradley Center last night. Friday night, the Bucks host the Washington Wizards at the Bradley Center at 7:30 PM. Bucks vs. Wizards tickets are still available for Friday night's game. 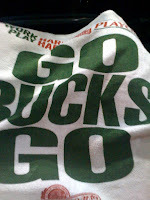 The Bucks have revamped their image, boasting a new "Be Milwaukee" slogan for the 2011-2012 Bucks season. On Twitter, Bucks fans are encouraged to tweet about the Bucks using the #BeMilwaukee hashtag. The Bucks players appear to be back in good health and this could be a good season for them! Go Bucks Go!